I’ll be sharing my most recent book, A Path of Stars (ages 7 and up), and engaging young readers in activities to learn about Cambodia including drawing the lotus, writing in Khmer, and sharing Cambodian food. Hopefully, the event will also include a performance by some members of the Portland Cambodian Dance Troupe. 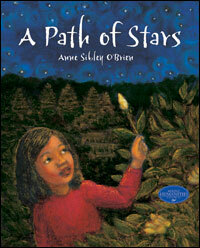 Thanks to a generous donation from Joe and Debbie Bornstein, every child who attends will receive a free copy of A Path of Stars. And I’m told that the Bornsteins plan to help promote the event with the Time & Temperature Building sign; that week, instead of “CALL — JOE,” it will say “PATH — STAR”! In the midst of a national conversation about immigration and assimilation, Portland is debating, not policy, but which book to read first. “I’m Your Neighbor, Portland” is a year-long, city-wide read and series of public events at the Portland Public Library designed to promote a sense of community among the city’s diverse communities. The city-wide read features nine books whose immigrant and refugee subjects made Maine their home in the last several decades and in doing so transformed Portland into a vibrantly multiracial and multicultural city. Read more about the books and events at www.ImYourNeighborPortland.org.